In this post I'll take a look at why HTTP-based transports are still used by realtime frameworks and services, why don’t all solutions use WebSocket, and which transports are best for different realtime use cases. The callback has been invoked, the Promise fulfilled. I'm *super-excited* to be rejoining Pusher to head up evangelism and developer experience. It’s interesting how I used to always talk about the Real-time Web and Real-time Web Apps but now it really does need to be Real-time Internet Apps because IoT (The Internet of Things) now means we need to think beyond what we would traditionally class as Internet technologies. 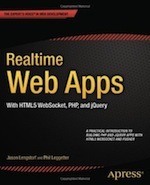 In this latest talk I cover realtime web technology communication paradigms and use cases for 2014 and beyond. Nearly two months in, I thought I'd publish 10 realtime web technology predictions for 2014 based on how it developed in 2013 and the trends I've seen so far this year. I've added two additional bonus predictions for good measure. I recently did a short interview with Future Insights. As part of that my talk video from FOWA 2013 was published. In this video taken at FOWA I cover all three parts of the guide on How to Choose your Realtime Web App Tech Stack. In this final part (sorry for the delay) I'm going to cover how you should approach choosing your Realtime Web App Tech Stack. Socket.IO has done an amazing job when it comes to making people aware of realtime web technology. And it's a great solution. But, it shouldn't be the default choice when choosing your realtime web solution. You should instead take a number of factors into account. Then, if it provides the functionality required to meet your requirements, use it. But there are lots of other fantastic realtime web solutions available that may be a better fit or your application's needs. In part 1 of this 3-part write-up from my talk at FOWA London 2013 I covered the History, Background, Benefits & Use Cases of Realtime. In this 2nd part I'm going to provide details on some fundaments about realtime web technology and an overview of the basic types of functionality that they offer. This is part 1 of a 3 part series on Choosing your Realtime Web App Tech Stack. It's based on the talk I recently gave at the Future of Web Apps. I quite frequently see posts on StackOverflow about how to add realtime functionality to a PHP application, or to build a realtime solution with PHP. And I'm increasingly getting emails asking the same. So, here's what I feel the current state of Realtime Web Technology is for PHP.